In a colorful land torn apart by strife and magic, one evil being known as Mormo threatens a dark rule across the land of Ditto unless one or two brave heroes can stand up to her reign. With but a few short days to prepare before Mormo becomes strong enough to remain unchallenged. Those with the fortitude and skill with toys and swords alike are the only ones that can stand any chance at bringing peace to the land. Their name? The Swords of Ditto. The Swords of Ditto are a group of heroes that show up but once every hundred years. Tasked with the goal of pushing Mormo out of power and delaying the inevitable, their task would be insurmountable to overcome in only a few days time. 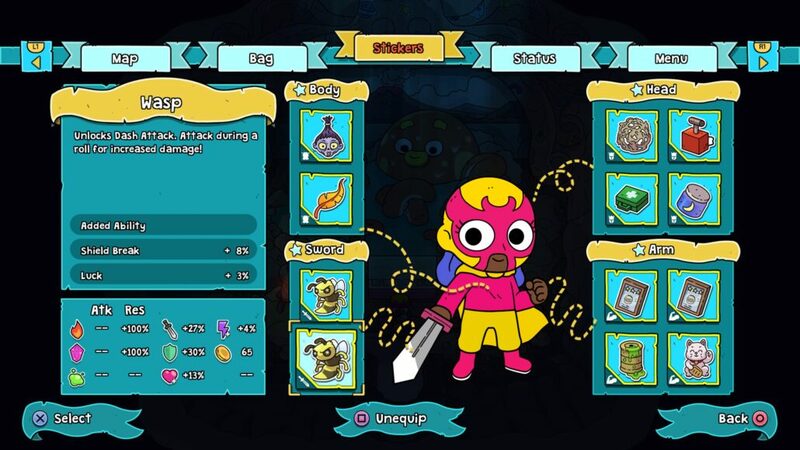 In each generation, the Sword you play as is random and ever-changing cosmetically (with no effects to skill and power); sometimes you’ll be a cat, luchador, robot, or plain poofy-haired heroine. Don’t like the hero you’re playing as? Sacrifice yourself to Mormo and plunge the island into despair for another century for a chance with a more stylish hero. 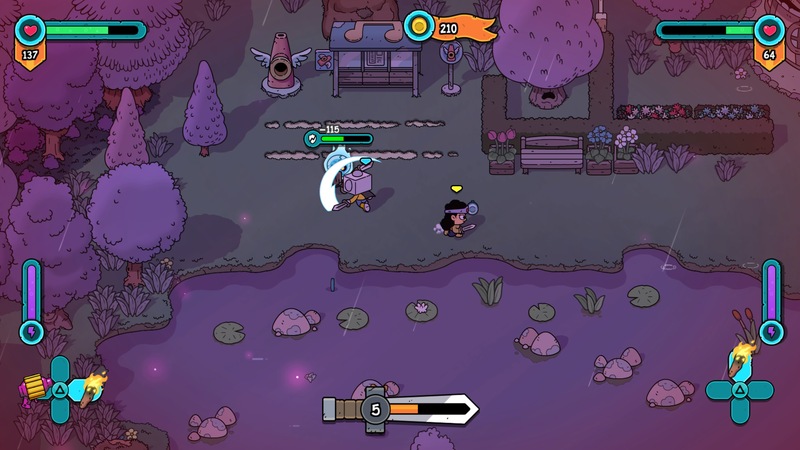 Swordplay is one of those aspects to The Swords of Ditto that pales compared to the rest of the title. Each hero is limited to a basic three-hit sword combo, with extra abilities being unlockable via upgrades in the form of stickers. The third sword clash felt delayed and lead to getting hit mid-swing so often that I opted for the first two swings and then dodge rolling away. Once your hero unlocks new Toys of Legend, Ditto’s version of the puzzle-solving tools from any Zelda game, these work nicely into combat. Sword attacks can be woven into bomb-throwing, record flinging, and golf club swinging attacks that can be as useful for solving dungeon puzzles as they are deadly. The Swords of Ditto’s inspiration from Zelda in terms of dungeon design fuses quite well with the roguelite framework that Onebitbeyond has developed. There are so many rooms and randomly generated areas that I’ve gone through multiple generations without seeing the same dungeon design twice. Prior to every fateful showdown with Mormo, players have the options to delve into two Toy Dungeons that each bestow the player with a unique Toy at its end, rather than in the middle as Zelda has conditioned us in the past thirty years of gaming. These toys can, in turn, be used in a pair of dungeons that contain Anchors, sources of Mormo’s power that can ultimately weaken her during the showdown on the final day. If you’re feeling confident enough, all four dungeons can be skipped entirely just by wasting enough time exploring the island (or sleeping it off) until the inevitable battle that will determine if Ditto will persist another hundred years of prosperity or despair. Ditto’s overworld map is just as randomly generated as the dungeons Mormo has created. The same trappings appear through each generation in one form or another: The town of Ditto, beaches, blacksmiths that can offer permanent sword upgrades, and a bevy of eccentric merchants and traders. What you’ll come across in each run may change, but you’ll always be making some sort of progress that will give future generations a better chance of survival against Mormo. Time won’t always be on your side and with only a few days to earn loot and glory, sometimes it’s best to dash through the overworld to your next destination (time ceases to move while in a dungeon). You might miss a lot of the secrets scattered across the island, but at least you’ll stand a better chance at leveling up and earning enough loot to defend the land for a little while longer. With each run through the ever-changing lands under Mormo’s control, the player will make gradual progression. Any experience and levels earned from defeating enemies will carry over into the lineage, as will time extensions bestowed by collecting and offering five Siren Orbs in a single run. A successful generation that sees Mormo defeated for another century won’t allow the player to carry over their gear, instead, earning a special icon that’s but a small piece of unlocking the true ending. However, see your untimely end before its time and the next generation may be able to make use of your tokens and toys to get a tactical advantage in the next life. A single playthrough of the life of one of the proclaimed Swords of Ditto should expect to last upwards of three hours, somewhat long for a Roguelite experience. Part of that time is spent with the mandatory prologue that begins the end of days for every hero: wake up, pray to the statue of the previous Sword of Ditto to gain their power, run off to Mormo’s castle and get mocked and trivialized, and lastly meet with the town’s historian that sends you on your way to explore the Toy Dungeons throughout the land and bolster your power. It’s an interlude that will waste about ten minutes of the player’s time each and every time they die, reducing the story’s pace down to a snail’s crawl at the beginning of every dungeon run. Once or twice, I could understand to help reinforce the story but when you’re on your seventh playthrough, that’s easily an hour of time wasted that doesn’t do anything to move the story forward. 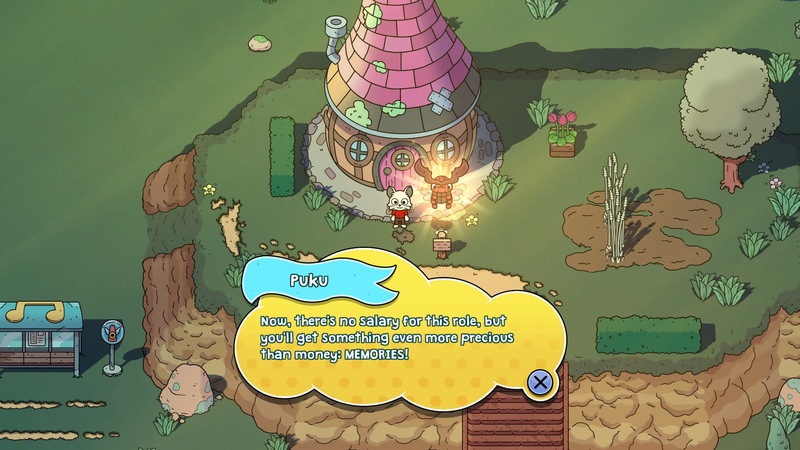 Currencies in The Swords of Ditto, both Celestial Shards and Gold Coins, are one of the few things that do persist in the character’s will, being passed along from generation to generation. With many of the toys and stickers costing hundreds of coins, that extra stipend of cash can make a run that much easier if you’re able to start with a powerful toy like the Drone from the beginning. Unfortunately, with how glitchy the current state of The Swords of Ditto is, I’ve come across numerous crashes to the PS4 menu. When that happens, I presume it’s in part due to Ditto’s anti-cheating measure and punishing the player for quitting the game just before seeing a Game Over screen, but I’d find my Gold reserves depleted down to nothing upon restarting the game. I understand that it’s to prevent players from losing the progress on their run by quitting the game forcibly, but I don’t think to punish the player for Ditto’s intermittent crashes is the right approach. If you’re feeling social, The Swords of Ditto can be enjoyed with a pair of Swords, hence the namesake. A second player can hop in and join in on the adventure, sharing the coinage and experience but hoarding food and bombs for themselves. Sticker upgrades are shared between the two, so putting a sweet shark sticker on your sword is something that both parties can get down with. If one of you goes down in battle? Well, it’s times like this that it’s best to just hug it out. That’s right, hugging your best friend brings them back from the clutches of death (and in a true arcade fashion, shares half of your life with them). 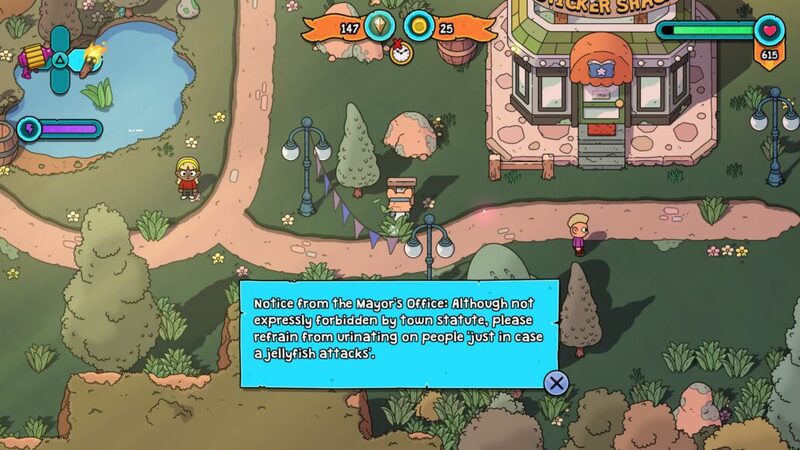 With all the charm of a Pendleton Ward cartoon, The Swords of Ditto is a beautiful little experience. Every citizen that suffers from Mormo’s wrath is charmingly drawn and filled with animated glee. The world in itself so is bright and colorful that it can be easy to forget that everything outside of the tiny town of Dittonburgh is out to kill you. It’s scientifically proven that it’s impossible to play The Swords of Ditto without breaking out into a smile at least once. 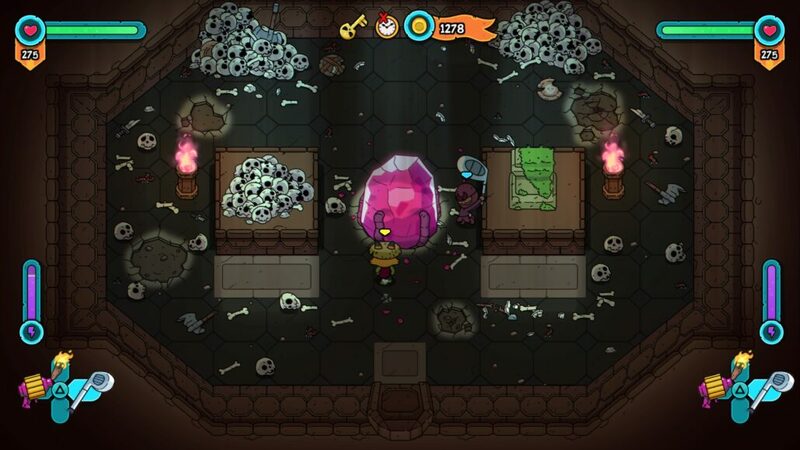 There are a few minor grievances with The Swords of Ditto that keep it from being one of my more treasured roguelikes, although both could easily be resolved with the right amount of programming and tender care, namely in speeding up the beginning of a Sword’s adventure and the crashes that creep up intermittently. Despite this, what’s already available to get in players’ hands is a charming Roguelite that offers more challenge and secrets than it initially lets on. Review code provided by the publisher. You can purchase the game on PC via Green Man Gaming. The Swords of Ditto is a devilish little Roguelite disguised as a cartoony adventure with all of the trappings of what Zelda fans have grown up to enjoy.